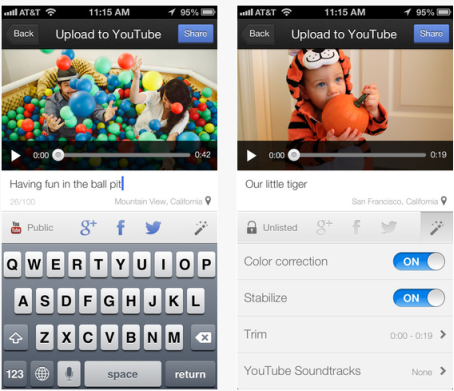 Google has released a new app called YouTube Capture app, that is especially for iPhone and iPod touch devices. YouTube Capture app helps us to recording the video quickly and uploading the video to YouTube directly. More over you can share the videos to other social networking sites like Facebook, Twitter and Google+ instantly within the app. You can record the videos from your iPhone quickly even before with the fewer clicks and less lag time. It is designed for speed to take the videos faster. When you click to open this YouTube app, it always ready to capture videos. After finishing the recording video, you can give a proper caption and share to social networking sites. You can minimize the app when uploading the videos that will be in background mode. Finally it has some video enhancement options like Color correction, Stabilization, Trimming and adding Music Tracks to improve your video better in quality. With this enhancement functions, you can modify your existing videos on your device also.